LAS VEGAS, Nevada - The Gallery is one of Las Vegas' newest and most lavish nightclubs, and has hosted major artists and entertainers including Nicki Minaj, Akon, Carmen Electra, Chingy, Cee Lo Green, LL Cool J and many more. Elegant and ultra-luxurious in décor, the Gallery, dance floor and Pussycat Dolls Lounge can accommodate up to 1,000 people as well as private parties and corporate and special events. The Gallery was built from the bare walls up and includes an all-new HARMAN JBL loudspeaker system with more than 90 AE Series and Control(r) Contractor Series speakers, powered by Crown amplifiers. R2W, Inc. of Las Vegas designed and installed the Gallery's audio system. "For the Gallery, we had the opportunity to provide a system that was 100 percent new, which enabled us to create an integrated system with JBL loudspeakers, Crown amplifiers and BSS processing, all working together and controllable via a simple user interface." said David Starck, Director of Engineering for R2W, Inc. R2W owner Jeremy McConnico and account manager David Potts collaborated with Starck on the project. The audio system for the Gallery dance floor includes eight JBL AM7315/95 3-way, 15-inch loudspeakers, four ASB6128V extended response, dual-18-inch subwoofers, and four JBL custom dual-18-inch subwoofers which are similar to the ASB7128, but in a V-loaded enclosure configuration. The Gallery Room fill speakers include 16 JBL AM7215/95 2-way, 15-inch high-power speakers, four AM7212/95 2-way, 12-inch models, two AC28/95 compact 2-way speakers, five ASB6115 15-inch subwoofers and 33 Control 47C/T ceiling speakers. The Pussycat Dolls Lounge features nine JBL AM7212/95 loudspeakers and seven ASB6115 subwoofers, and the DJ booth is equipped with two AM7212/95 speakers and ASB6115 subwoofers. "There were a number of acoustical challenges we faced in determining which models of loudspeakers to use, and where to place and aim them," noted Starck. The main room was all hard surfaces with very little absorption anywhere. The only sound absorption is the thousand bodies that fill the room every night. On top of this, the owners wanted the people paying for their tables to be able to hold a conversation, but still have a powerful system for the dance floor. This is typical for most clubs in Vegas now and it's difficult to achieve this kind of acoustic balancing act as there is no physical division between the tables and the dance floor-just one large room." "To overcome this, we designed a very focused, very high-powered system over the dance floor," continued Starck. "The main clusters are angled down at the floor so the bulk of the speakers' output stays there when the dance floor is filled with people. We fill the rest of the room with sound by a ring of speakers that is aimed out and away from the floor. This also helps to keep everything time-aligned outwardly from the dance floor." "We went with an all-HARMAN system because of the proven reliability of the components, the vast array of options throughout the product lines and mostly, because of the ability to integrate the BSS Soundweb London digital audio signal processors and controllers, Crown amplifiers and HARMAN's HiQnet System Architect(tm) communications protocol into a single user interface for the club sound technician and DJs. 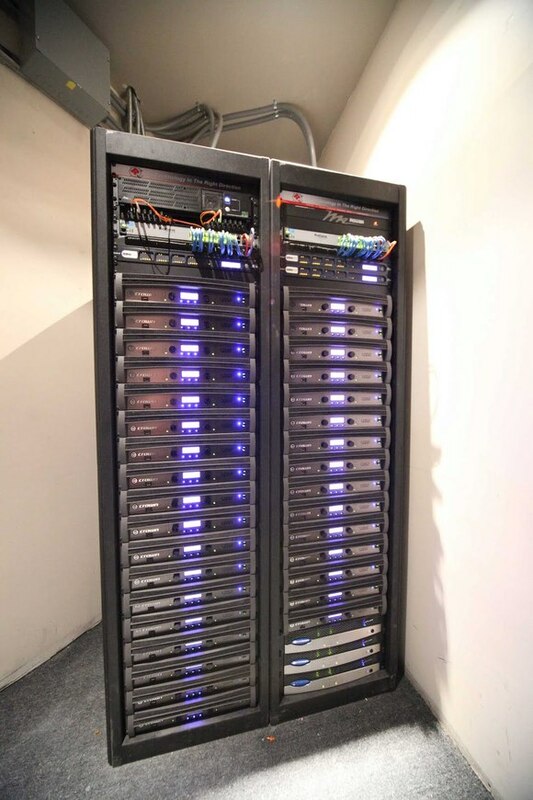 They are able to easily adjust zone levels and also get real-time feedback from all of the amplifiers and signal processors to know if they are pushing the system too hard or if there is trouble in any of the components." "This appears to be working quite well," Starck pointed out. "The club has been open for several months, and we haven't had a single blown driver. We received a call once from the Gallery about thermal errors they were seeing in one amplifier. They were able to turn that channel off using System Architect. When we inspected the system the next day, we found that a single loose strand of copper in one of the speaker terminals had been shorting the amplifier. No damage was done and in fact the amplifier never shut down-it just kept on playing and reported the thermal error. That level of control and diagnostic feedback is remarkable in an audio system." "The Gallery installation turned out to be outstanding," Starck concluded. "The owners have a couple of other clubs in Las Vegas and have told us that the Gallery sounds the best by far."